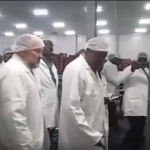 Video: President Uhuru Kenyatta visits Seaflower Pelagic Processing on a familiarisation tour during his official state visit to Namibia, Chairperson of the Seaflower Board, Adrian Louw accompanied the visiting Head of Sate on a tour of Namibia’s new flagship fish processing facility. THE inner workings of Namibia’s flagship fish factory, Seaflower Pelagic Processing, was for the first time revealed to the public during a visit by Kenyan head of state. President Uhuru Kenyatta during a visit to the port town of Walvis Bay also included a visit to the mega fish factory that started production in January. The visiting head of state had the opportunity to look at the unique way the factory processes and adds value to horse mackerel on land. President Kenyatta during his visit on Saturday said that Namibia and Kenya can learn a lot from each other with regards to the protection of its fish resources from illegal and unreported fishing activities. With regards to the development of the so-called Blue Economy the visiting Head of State also took note of the principle of value addition to resources to create work and eradicate poverty. The Minister of Fisheries and Marine Resources, Mr. Bernhard Esau, during his state of the fishing industry address held Seaflower Pelagic Processing (Pty) Ltd, as the example for other more established processors to follow in order to create jobs and add value to Namibian products. Mr Esau informed the visiting president that the factory is one of the largest land based frozen pelagic processing facilities in Sub-Saharan Africa with a processing capacity of 600 tons of Horse Mackerel per day. Mr. Adriaan Louw, the Chairperson of the Seaflower Pelagic Processing Board, said the world class facility is the result of years of hard work and a huge amount of pooled experience. The way Seaflower Pelagic Processing catch, processes and sells the final product will forever change the industry landscape as well as the way in which business is conducted with fish as a precious Namibian resource. Mr. James Hatuikulipi, a director of Seaflower Pelagic Processing and Chairperson of Fishcor the board, said that the simple fact that the fish is frozen on shore instead of in factory ships at sea creates seven jobs more per ton of fish landed. The new processing facilities has the built-in capacity to produce frozen horse mackerel in various different formats that is custom designed for the local market and markets beyond Namibia’s borders.